Classic Ironworks understand the importance of ensuring the design of your balcony fits in perfectly with the appearance of your home. Glass balconies from our Bristol experts are the perfect solution for a modern home, and one that will bring luxury and add value to your property. A glass balcony can be manufactured by our experts to meet your exact needs and requirements, and you can also choose a combination of materials for your terrace such as a steel and glass balcony. Our experience in glass balconies can be seen by the wide range of types of design we offer, glass Juliet balconies being as popular with our customers as grand affairs that stretch the entire width of stunning modern homes. If you are considering a glass Juliet balcony for your home, or even a steel balcony, we suggest you get in touch with our architectural glass and ironwork experts. Our highly trained experts have the knowledge and experience necessary to manufacture and install a balcony at your property in virtually any style or material you desire. Glass or steel balconies are a simply stunning option when you are looking to create more outdoor space for your modern or contemporary home. We are confident that we have what you are looking for in your design, and our experts can help you choose the perfect style of terrace, verandah, or Juliet that will add allure and value to your property. Balustrades from Classic Ironworks can be functional or simply decorative, all our balcony design adding value and aesthetic appeal to your home. 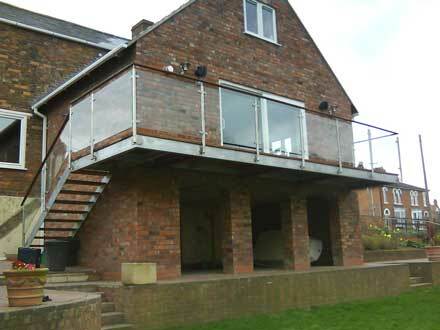 Contact our specialists today to discuss you stainless steel balcony or glass terrace design. Glass is not just an attractive material for your new terrace. It is tough and strong, and when used in combination with stainless steel, concrete, or even iron, we can build you the balcony of your dreams that will make a bold statement for your home that will last for not just years but for many decades to come.